The slow, steady erasure of California’s middle class holds the very real potential to descend that state into a version of the chaos and anarchy in Venezuela. Yes, yes, that sounds like the crazy hyperbole we hear from the Left. But it’s not. If not for the fact that we still have a functioning democratic republic with both an undergirding constitution and long heritage tethering that careening state to the more stable Union, it actually would be almost assured. The burgeoning lower end of the state and the walled off high end of the state are squeezing the middle, resulting in an eye-popping number of productive Californians fleeing the state. We think that because California is so large and prosperous that it always will be. It has Silicon Valley and Hollywood and a pretty solid creative class, along with outstanding weather and a beautiful natural geography from oceans to mountains. The problem is, that is only part of the picture. Venezuela also had a top tier of wealth and entrepreneurship, plus a bustling, growing middle class and massive natural resources, such as oil — along with the ocean and mountains. But through overbearing government control of private businesses, ever increasing taxes, transfers from the working classes to the not-working class, and ultimately nationalization of industry, the socialist leaders of that South American country managed to crush and eliminate its thriving middle class. And that was the final straw that began the chaotic and rapid spiral into the horrific desperation the country is experiencing now. Want to know what Alexandria Ocasio-Cortez’s vision for America would look like? There it is. A middle class is required to sustain an economy and ultimately a stable society. A middle class provides stability in the culture, political stability, entrepreneurs and plentiful responsible workers that hope for a good life. It is fuel for a thriving capitalist country. Any society that does not have a middle class — just a thin upper and vast lower class, a la feudal societies — is doomed to strife, a crashing economy, anger, resentment and ultimately revolution. This has been Venezuela’s path. Starting with the Socialist/Communist President Hugo Chavez — whom Obama praised and literally embraced — and continued by his fellow socialist, Nicolás Maduro, policies squeezed out the middle class and bled them until none were left — leaving the country with only some rich people and a whole lot of poor people. California is in the early stages of the exact same dynamic. That state is experiencing overbearing government control of private lives, religious freedoms, private businesses, draconian environmental regulations, very strict land-use laws and eroded property rights. What the state does not regulate and control, major cities such as Los Angeles, San Francisco, Oakland, San Diego and Sacramento do. Hardest to miss is that the California Assembly in Sacramento adds ever more taxes, as do most of the major cities in the state. California has one of the highest income tax rates in the country, with 10 rates up to 13.3 percent as of 2018. (Of course, it is all on top of federal taxes.) Property tax rates aren’t bad, but they are on the most inflated property values in the nation, and they are levied on full market value, which means in real dollars they are sky high. Sales tax is high at 7.25 percent. Gas tax is 54 cents per gallon, second highest, on gas prices that are among the highest because of regulations — making gas 25-30 percent higher per gallon than the rest of the nation. But California also kills with a thousand cuts by taxing an incredible number of oddball items for political purposes, i.e. fruit out of a vending machine has a 33 percent tax. Regulation is always harder to assess specifically, but the results are not hard to see. California has earned the reputation for having the most onerous regulations for companies and land-use in the country, which makes everything more expensive — on which the high tax rates are then levied, added to the smothering cost-of-living burden. Socialist-minded Democrats then take the enormous tax largesse they have extracted from struggling middle class Californians — and the wealthy elites in secluded conclaves that can afford it — and transfers it to the burgeoning non-working classes. The state spends $106 billion annually on welfare at the state level, nearly twice as much as the next largest state, New York, and three times as much as the third highest state, Texas. California’s $103 billion is the lion’s share of it’s entire budget of $183 billion, dwarfing the next largest item of education — on which it spends more than the national average. The largest welfare cost is Medi-Cal, the healthcare program for low-income Californians, which now has 14.2 million people enrolled — meaning more than one in three state residents are on government healthcare. California also provides cash payments to people who work but do not earn enough to pay taxes, another transfer payment from the middle and upper income to the low income. Relatively paltry amounts for such a large state and budget are spent on infrastructure — things the middle class relies on — such as $2.8 billion on roads, about 1 percent of the budget. Remember, while more than one million people exited California for other states — that’s a net number, one million more left than arrived — the state’s population still soared. There is obviously only one place all of these new residents are coming from; immigration. Some of those are legal immigrants, a portion of whom bring talents to the state. But millions are illegal immigrants. California is estimated to have close to three million illegal aliens inside its borders, and about one in ten workers are illegal aliens, although these numbers are really unknown. Virtually all of these people are receiving some form of transfer payment from California’s middle and upper income residents. The exorbitant costs cannot be sustained by increasing portions of the middle class. This is maybe most clearly demonstrated in the exodus from California. San Francisco represents the problem precisely. Perhaps the most liberal major city in America, San Francisco residents pay some of the highest taxes and deal with the most overburdening regulations — particularly on private property use — in the country. This has resulted in a median home price of $1.6 million dollars. The average rent for a one-bedroom, unfurnished apartment in the city is about $3,258 per month. These astronomical prices stun most of the country, but this is a clear result of the first stages of Socialistic tendencies in government control, regulation and taxation for redistribution. This dynamic is in operation throughout the Bay Area, and in Los Angeles, San Diego and Sacramento. California families on average paid three times their income for a home in 1970. Now that figure has jumped to nearly 10 times their income. The nation as a whole has seen nothing comparable, which of course becomes almost impossible for the lower part of the working middle class. The major metro areas technically have very low unemployment. But in reality, they have a massive homeless population, a street defecation epidemic, a diminishing working class and a mushrooming illegal alien population. Between 2007 and 2016, California lost 1 million more domestic residents than have come into the state, according to the IRS. Many are moving to Texas, Arizona, Nevada and Oregon. This is ongoing. Major, well-paying companies such as Toyota, Occidental Petroleum, Nissan and others who paid between $80,000 and $120,000 — solid middle class pay — have shuttered factories and left the state due to the overly burdensome regulations, taxes and cost of living for workers. Those people have fled to Texas, first, and then other states where they found it affordable to live and raise families. The picture painted here is one of the middle class being squeezed out in a way that even the naturally beautiful weather and geography cannot overcome. The reality is that California is slowly driving a stake through the heart of its once thriving middle class. And that is where the parallel with Venezuela is so strong — and dangerous. 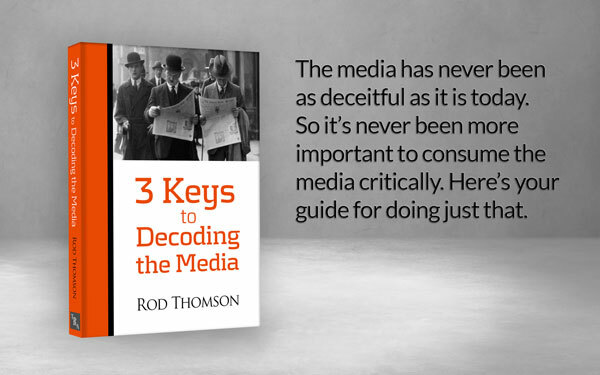 Rod Thomson is an author, TV talking head and former journalist, and is Founder of The Revolutionary Act. Rod is co-host of Right Talk America With Julio and Rod on the Salem Radio Network. Can’t happen. The Federal Government is on the hook for anything California does. ps. disqus is decent commenting software. Disqus censors content for political speech, and originating IP. I have been shadow banned many times on that platform. We do not have a “democratic republic”. We have a Constitutional Republic. Thank you for stating the obvious mistake in this article. I will never vote for any politician who agrees to bail out those nitwits in California who have given away their money to the public employees retirement system and to the illegals so they could “feel” good about themselves. What a bunch of jackasses along with the head jackass, Jerry Brown who should be tarred, feathered and hung from the highest tree along with all of his supporters. The feds will stop subsidizing the states and the states will stop feeding the poor. What can we do to hasten the demise…..
Kalifornians can always go to Nevada to get toilet paper. The middle class only existed because the rich people wanted one back in the 20’s.. Now that the want is over, so is the middle class. The new plan, as has been discussed on the web for a while now, is to dissolve differences between the US and other countries so that the world is a more homogeneous society economically, with the US being brought down while trying to raise up the rest of the world. Nothing much has changed with the global interests as exemplified by the Deep State. While the election of President Trump was a change in direction, those who oppose him seem to be getting the upper hand once again with the seeming inability to stop declines in the middle class as exemplified by the article above. Hopefully some articles on how to turn this around will be forthcoming. In the meantime just talking about it is merely that, talking about it. Government needs to bring quick reforms to tackle the problem with the country.